" Every night I drink either wine or sake. Nowadays I am really interested in the world of sake." Master Chef Dominique Corby looks so happy while he enjoys the aroma of sake from a wine glass. He is spreading the mysterious charm of it out to the world. 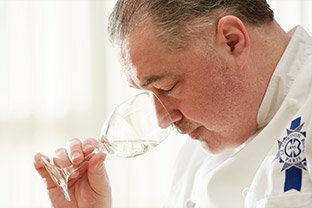 During consideration of the best ingredient as the topic for the first volume of this series, Chef Corby proposed talking about sake, a Japanese spirit made from pure rice, because it is the most popular type of alcohol in Japan.
" The tastes and views of sake have changed from when I first came to Japan and now. To tell the truth, at first I wasn't so interested in it." After he came to Japan, he worked vigorously at cooking. The sake at the time did not excite him. One day he went to an izakaya (a Japanese pub) and he had a glass of sake. He was surprised to find the scent of it to be so full of flavor.
" I had not drunk sake from a glass until that moment – but that was the turning point. Usually, an ochoko, which is a special drinking cup used for sake, is utilized. Not using the sake cup made the experience very different. Immediately I wanted to taste sake from a wine glass." Chef Corby had tasted sake 12 to 13 years ago. At that time, the sake world was in the middle of a big change. An era of mass consumption was ending, and younger brewers were coming to prominence, going back to the basics with handmade versions, pursuing genuine flavors, etc. This was surely a transition period for the transformation of sake. After this, Chef Corby began visiting sake breweries. Every time he visited a brewer, he felt their passion, and at each step of the way he became more awakened to sake.
" There are many parts of wine and sake that closely resemble each other. Wine too experienced a new era with Burgundy and Bordeaux: the utilization of new areas as well as young makers coming to prominence distinguished the times." According to Chef Corby, it’s not a question of which one is the most delicious. If you know the respective personality of each sake, the idea of which dish best matches a particular sake emerges. First, from the chest area swirl it around in a wine glass. And then, the scent of the cask that the sake was made in rises. After that, bring your nose near the wine glass to enjoy the aroma. Yes! You can take pleasure in the scent of sake twice. This is Corby’s way of enjoying this traditional Japanese alcohol.He insists that the day will come soon when the world is surprised by how compatible sake and French cuisine are. Which sake goes well with French cuisine? This goes well with a meat dish. 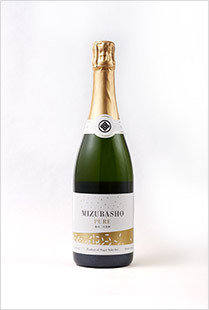 This sake is born from the nature of the Oze region and made in the manner of champagne. " It has the fragrance of farm grass. It is not the scent of a fresh grass; rather it is a dried grass. It goes well with beef tartare." This is popular with women because the alcohol content is not very high. " I can smell violets. Put an apple citrus jam next to sea bream or another whitefish. 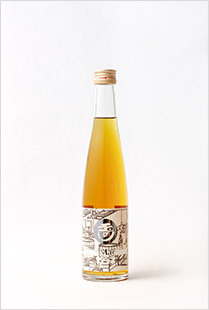 Splash some vinegar on it to complement this sake even more." 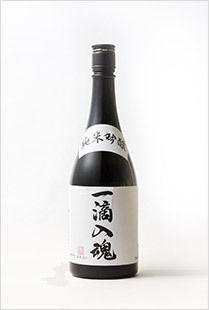 A mature, well-cured sake made according to Edo Era methods. " This one is easy. It has a honey-liqueur scent. So, I’d like to put baked apple and butter on a crêpe covered with crème pâtissière." 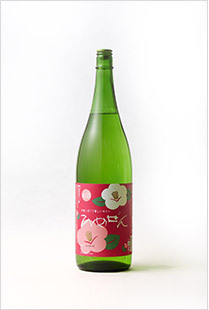 This sake is brewed using freshly harvested brewer’s rice that is diligently polished. It is prepared carefully, without rushing, during the mid-winter and made with natural underground water. " It has a light body and is fresh, with a smooth taste. Pairing this with cheese is an interesting idea." Chef Corby said that he has not forgotten a single word from the discussions he had with the chief brewers when he went around the Hiroshima area.
" The chief brewers lament that they can sell sake but they cannot sell sake kasu (sake lees). But, I found a more profound taste in the sake kasu. And I thought that I could use this." 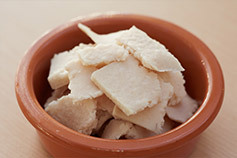 Thus, he used sake kasu to make a dessert. Start with fresh cream, add a little mascarpone and sugar, and mix in some sake kasu. Whip these ingredients. 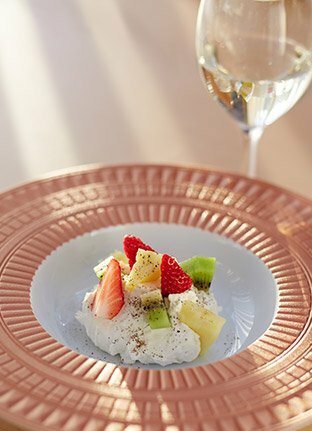 Garnish this sake kasu cream with lots of seasonal fresh fruit. Finally, sprinkle some pepper on the cream to accent it perfectly, and you’re done.
" It is so simple, but you’ll be surprised at how delicious it is. Enjoy it with a glass of sake." With this dessert, you savor one bite, and even though it is a light taste in your mouth, the sweetness lingers for a long time and spreads throughout your whole mouth. And then take a sip of the sake. You will find that the faint sweetness matches the sourness of the fruit. This is a new world of sake that Chef Corby has taught us. 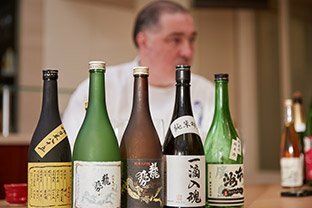 He nimbly jumped over the typical notion of the way to enjoy sake with an idea that Japanese people cannot even imagine. He smiles, looks at us, and says, " See, you are surprised! " When making sake, there is a white substance left over after a compression step. This is sake kasu. In the wine-making process, it resembles the strained lees of the grapes. This time, Chef Corby created an astonishing dessert using sake kasu.